1. You see a cap stand. Have you ever seen one in a normal Indian’s house? Nai na? But an Army officer’s house will have one for sure. Having a cap stand in the house, mostly near the front door or in the spare bedroom, sounds so British. Every time a civilian relative/friend comes over, the first thing they will ask is why on earth do you have a XXL sized key holder? 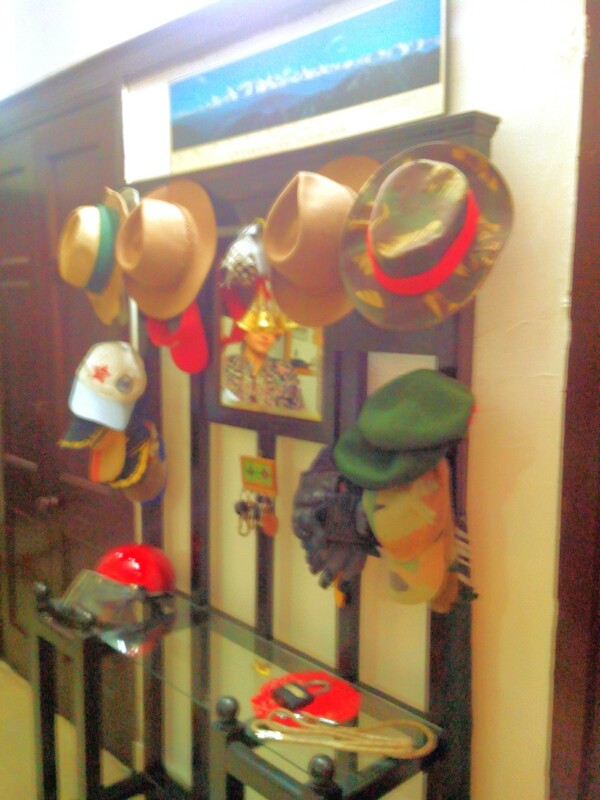 And then you patiently tell them that it is a hat stand which is needed to hang the peak-cap and the games cap and beret and the regimental hat and the golf cap and the combats hat and the NDA/IMA/OTA cap and that branded cap and that hunter hat and…. you get the drift! The wife of Major Sa’ab’s CO was kind enough to let me click a picture of her elaborate cap stand. 2. Drinks and appetisers are served in crystals. Even the ashtray is a crystal one. 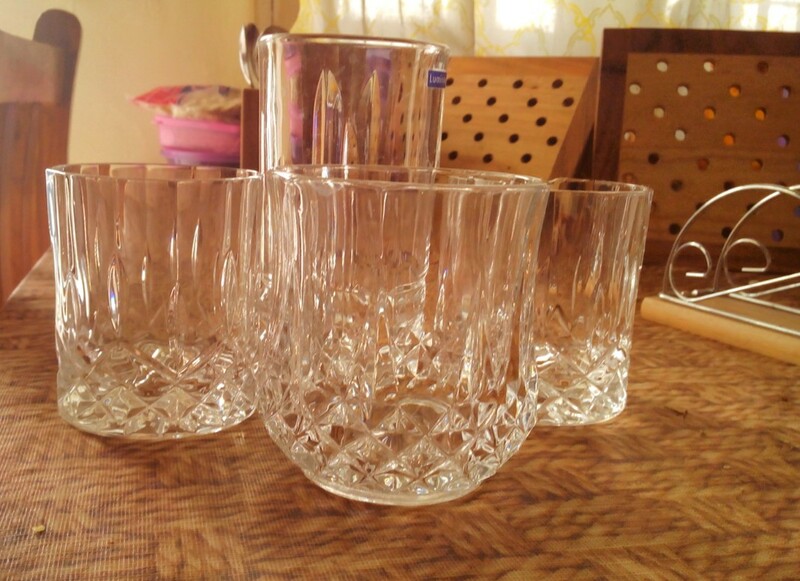 Whisky glasses, juice glasses, snacks, desserts and mouth-fresheners too are mostly served in crystalware sourced from the north-east, in and around Siliguri to be specific. If Army officers have their way, they will take bath in crystal buckets and also get window glasses replaced by it. And there is a high probability that they’ll gift it too! Moral of the story, crystals are a fauji’s best friend. 3. You find one of these five things in the house: (a). 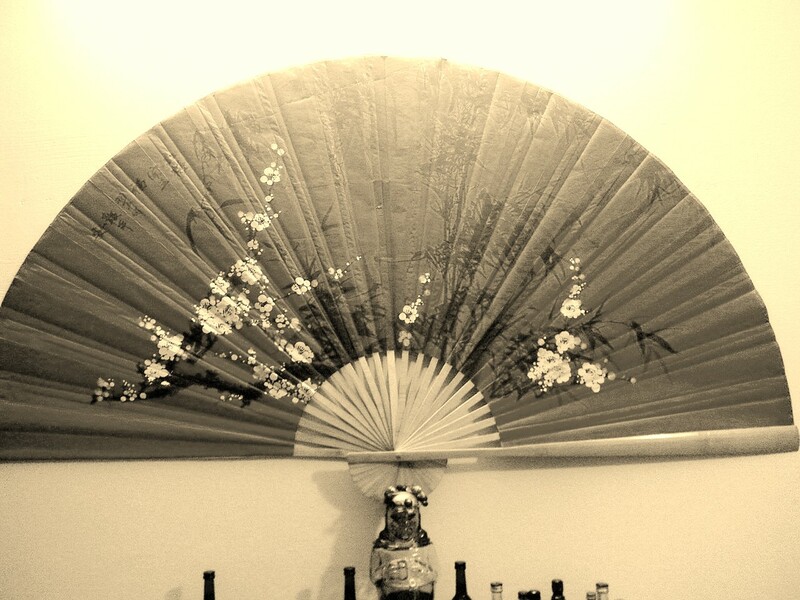 A giant paper hand-held fan. 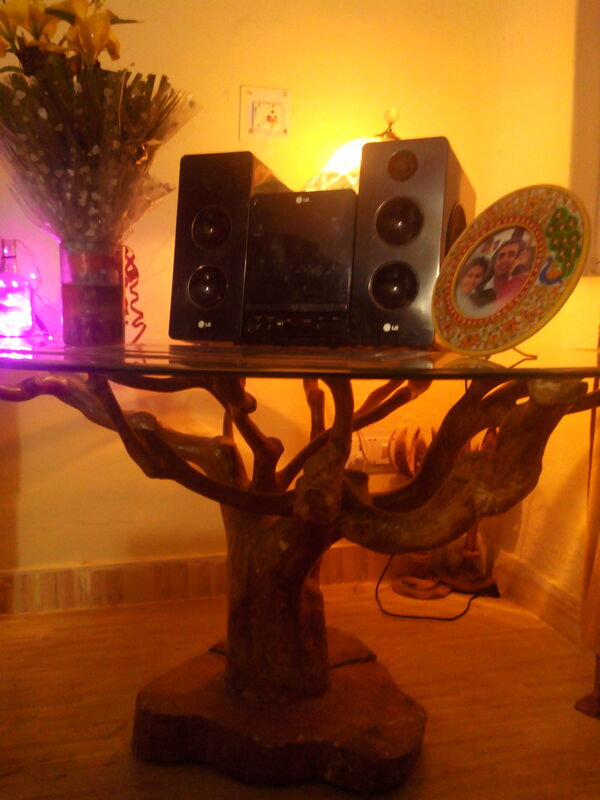 (b) A weird glass top table with…err..are those tree branches posing as its legs? (c) A piece of home décor form Rajasthan, like those hanging puppets or a wooden carved chair. (d) Swords, spears, fancy looking trophies and group photographs of various courses in which everyone looks exactly the same. (In case of Air Force officers, it is toy models of various aircrafts and for Naval officers, ships and anchors.) (e) Racquets of all racquet-sports (yes, and not just one) and/or Golf kit. Tree-branch repurposed as a table stand. 4. There are more peg tables in the house than there are pegs and tables put together. It kind of makes having a centre table redundant. Oh wait, the centre tables are for that crystal ashtray in point No.2. 5. You see non-functional chimneys and fireplaces (even in relatively warmer stations). What is the deal with that, seriously? Are we supposed to feel the warmth by just looking at it? My kitchen has a chimney placed strategically over the stove. It is just eating up precious storage space. And the best part is that it is blocked. But is it? Wait till it starts raining — the chimney will leak like a bloody tap. 6. You see a giant shoe-rack full of — what the hell — men’s shoes? Correcto! An officer’s shoes will hijack the shoe-rack which is originally a woman’s territory. Two-three types of DMSs, a couple of running shoes, then two-three formal shoes, a fancy pair of over-expensive sports shoes, a couple of those trusted Woodland shoes and…. you get the drift right? If not, refer to the ‘drift’ in point No.1. In my house, there was no place for a second shoe-rack. As Major Sa’ab’s footwear was literally falling out of the 5-6 storied rack, I finally had to get a space-saver shoe hanger for myself, you know, the one which one hangs at the back of a door and has pockets to keep the footwear. This borders on domestic abuse but what to do! When glitter and boots simply cannot share the same shoe rack. 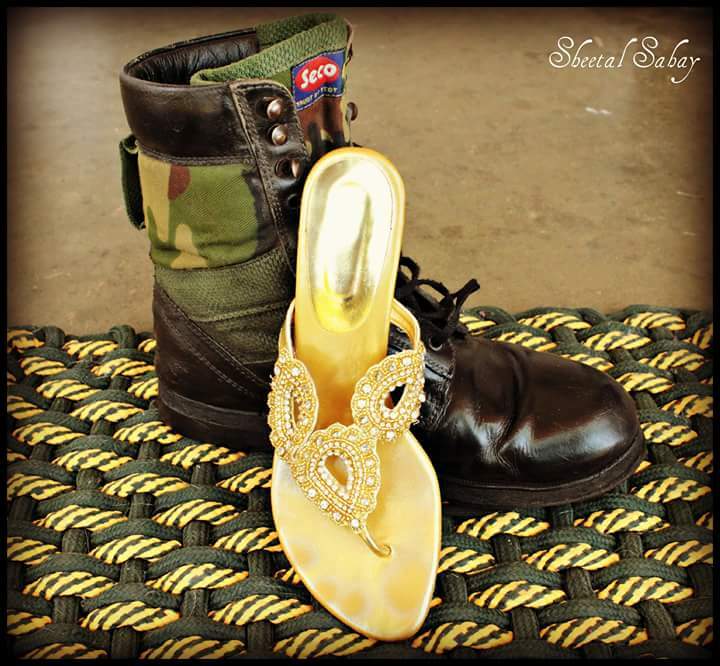 Picture clicked by another Army wife Sheetal Sahay. PS: All pictures in this post are from the houses of real Army families. And I am thankful to all of them as they allowed me to raid these special corners of their quarters. Aww..such a sweet post honey! You are most welcome any day to click more pictures. Mundane stuff looks so much more gorgeous on your blogs. Thanks for covering something that is so obvious to us, that we keep overlooking it. Excellent write up.Fauzi wife is unique & so also the husbands. Thank you 🙂 We are definitely unique! No doubt about that. Stay tuned Doc cos more such peeps are in the pipeline. 🙂 Thank you for stopping by. So yours is an ideal fauji house 🙂 Kudos. What a wonderful post, covers all the points of a fauji home. Nicely done. Just think it is not the most apt and complimentary word for army. Smiled a mile thru this 🙂 Well written with that dash of craziness we are infamous for ! Very well written …I have all these in my house. A truly fauji house you have then. :)Thank you. Apart from the metal trunks, I haven’t seen any of the items you have mentioned! Sounds interesting and practical though. Why don’t you write more about it and I will be happy to post it here :). Ah yes, I double-checked with my uncle who is in the Navy about the fireplace thing. He also said that thankfully MES had the good sense of not installing fireplaces in coastal areas. What a killjoy :D.
Appreciate your kind words :). I’ve followed your blog also, the first post caught my attention. I am retires fauji staying in non Army location at mid size town. No matter how I have tried to look a typical civilian, I find we still possess all things mentioned and displayed proudly. Lovely article!!!! If I may add to it…the decor will also clearly show the places where all one has been posted to!!!! Hey very nicely written! All the points are so so true.. 🙂 Request to include “Before” and “After” taking over the house…again its a life time experience in each station! All in all…Interesting blog….it also set me thinking wat else is there in all fauji homes, like carpets of all shapes and sizes, the mhow paintings, wrought iron furniture, especially the swing, And soooo many precis’… enjoyed reading….all the best! Very charming and entertaining. Well it’s a “home” you love returning to for the $million smile she wears on seeing you – most precious, of course among the other relevant stuff to earn the title Fauji !! I grew up in a Civil Servant’s house (during the late 70s and 80s) and guess what, most options check! Everything except the cap stand. I also lived in a Bungalow with a fireplace in a place like Coimbatore! And the chimney…well the kitchen roof caved in, so when they repaired the place, they left the chimney out! I inherited that tea-bush table! Well, in addition we had lots of deer horn and bison horn as décor! great write up, and so matter-of-fact – to the point. Oh dear, I have been grappling with this problem a lot. Just three days back a friend told me a trick to prevent my content from getting copied. High time to implement it! Thanks for bringing it to my notice though :). And good luck to you and ur capt sa’ab. Thank you Shipra for dropping by. It’s so refreshing to have you here, women from non-Army background rarely read my posts! 😛 Managing a fauji home is just as difficult as managing a non-fauji home I guess. It’s just that women put their feet up and let their hair down when the husband is away for months !! So that’s a breather, which we all ignore because we worry about husbands more 😀 . Too good madam.Relieve some old memories. You are hilarious! And your writing is a total treat. M hooked.